Brentford may be 18th in the table but they’ve been the most dominant shooters in the division so far, with three more chances created per match than anyone else and one of the more miserly defences. It definitely looks like there’s plenty of scope for them to climb the table. QPR in 15th are another team who look better than their league position suggests, while the opposite can be said about 10th-placed Ipswich. Burton have allowed almost 10 more shots per game than they’ve taken, which spells trouble quite frankly. 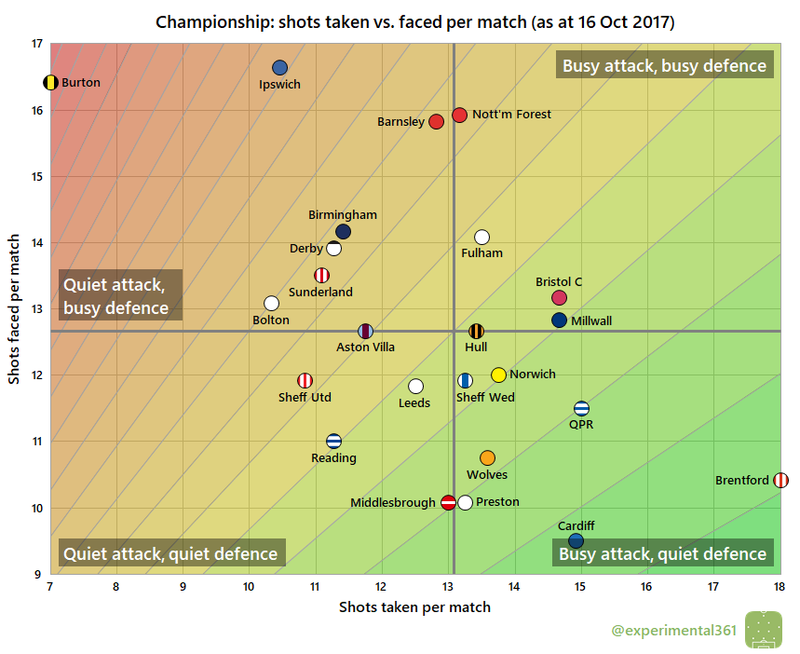 We can solve part of the Brentford mystery here: they may be taking a lot of shots but only Birmingham and Bolton have needed more attempts to score each goal so far. There’s also a hint at why Ipswich are doing so well despite creating relatively few chances: they’ve been ruthless in front of goal so far, with fewer than six shots taken for each goal scored. Preston‘s defence has stood out so far: only Cardiff‘s has allowed fewer shots and nobody has soaked up more for each goal conceded. 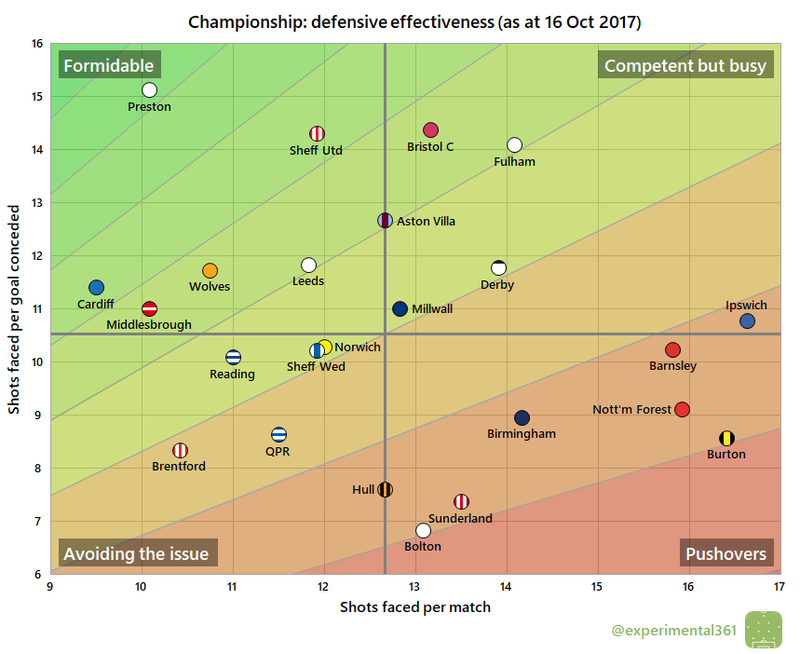 It’s not just the attacks that aren’t firing properly at underachievers Brentford and QPR: their defences have been pretty leaky too. The same goes for Bolton, who unfortunately boast both the most wasteful attack and the most porous defence so far. 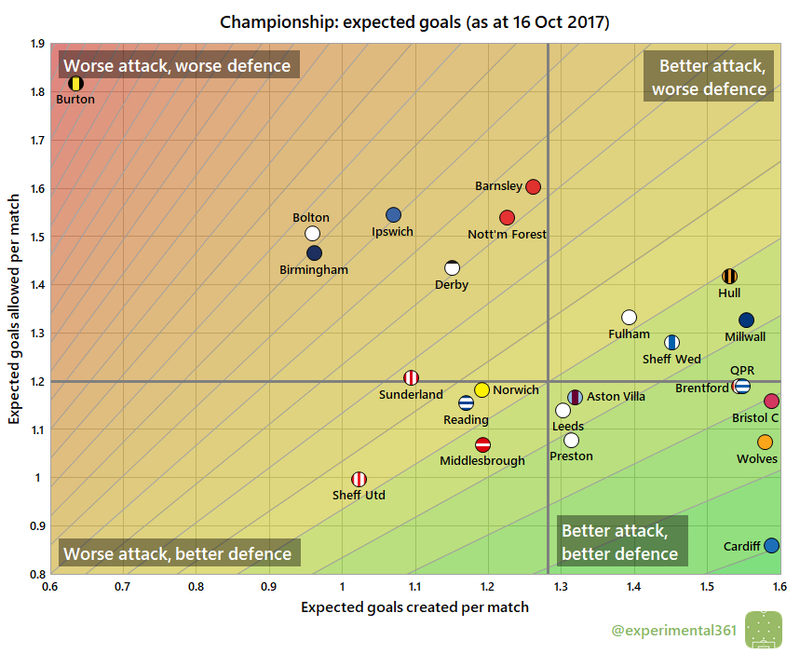 It’s interesting to see that two of the relegated clubs – Hull and Sunderland – are shipping goals so readily, given that their defences have recent experience of Premier League attacks. However, a lot of said experience will have been lost with the extensive remodelling of both squads. When we correct for shot quality, Burton somehow contrive to look even worse: they’re creating chances of around a third of the quality of what they allow their opponents, which is dire and really needs to change. Cardiff still look the best overall, second only to Bristol City among a host of strong attacks and with a relatively shot-shy Sheffield United their closest challengers in defence. 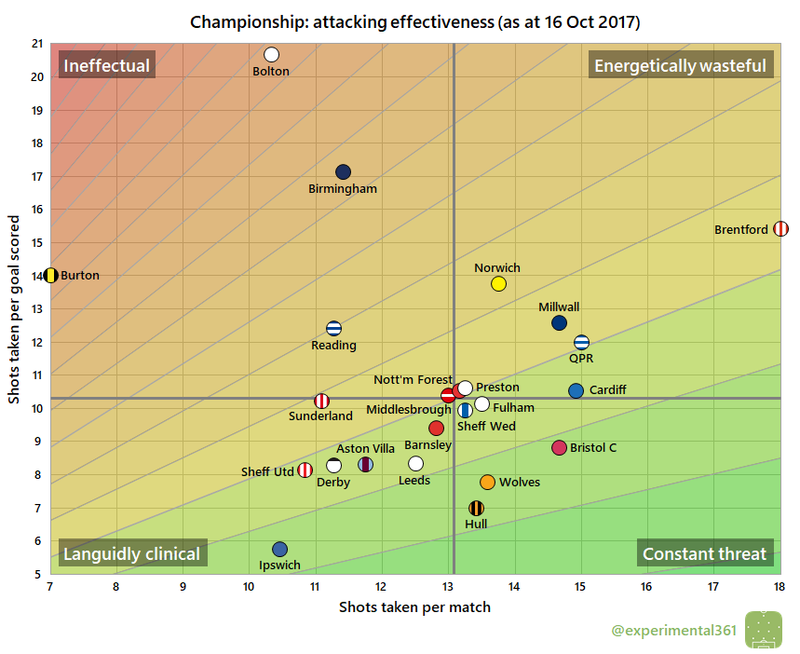 Fellow title challengers Wolves also – unsurprisingly – look pretty strong overall, while both Hull and Millwall need to improve defensively if their impressive attacks are to fire them up the table.